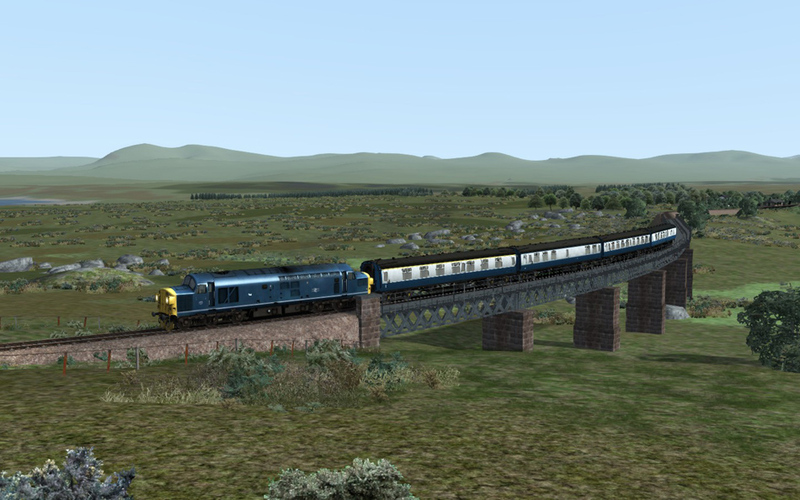 The 98 mile long West Highland Line between Helensburgh and Fort William is arguably one of the most scenic railway lines in the British Isles with two impressive summits at County March and Corrour. The West Highland Line opened in 1894 giving Fort William a vital link to Glasgow and the rest of the UK. The route is set in the early 1980's when the line still had semaphore signalling before Radio Electric Token Block (RETB) was installed. The route includes a 37/0 locomotive and a selection of rolling stock from the period. The route starts at Helensburgh Upper Station above the River Clyde before following the shore of Gare Loch. It passes through the closed stations of Rhu and Shandon before passing the naval base at Faslane which had a railhead during World War II. Today Faslane is where the UK's Trident submarines armed with nuclear missiles are based. Just beyond Faslane is Garelochead Station, the first traditional West Highland Railway station with an island platform. After leaving Garelochead the railway runs above Loch Long before turning away briefly for Glen Douglas, the first summit on the line at 564 feet above sea level. At Glen Douglas there is a rail-served MOD munitions depot with exchange sidings. Glen Douglas no longer has a station but there is still a passing loop. North of Glen Douglas the line descends above Loch Long to Arrochar before coming to Arrochar and Tarbet Station. From Arrochar and Tarbet Station the line follows Loch Lomond. Running above Loch Lomond the line passes Loch Sloy hydroelectric power station. During the power station's construction there was a siding and station here. The line then crosses Creag an Ardain Viaduct, the only stone viaduct on the line, before entering Creag an Ardain Tunnel, the only tunnel on the line when it was originally constructed. The railway leaves Loch Lomond behind at Ardlui and starts its climb up Glen Falloch Summit before descending into Crianlarich. Crianlarich is an important station with sidings and a shed and is now the junction for the Oban line. After leaving Crianlarich, the line crosses the former Callander and Oban line from Crianlarich (Lower) to Stirling. Crianlarich Lower is still in use (at the time of the route) as timber loading sidings. North from Crianlarich the vegetation changes as the terrain starts to become open moorland. The line climbs up to Tyndrum Upper station on the long gradient to County March Summit, between Ben Odhar to the East and Ben Bhreac-liath to the West. From the summit at County March the line descends down the side of Ben Odhar before rounding the Horseshoe Curve crossing two viaducts and following the side of Ben Dorain before coming to Bridge of Orchy Station. At Bridge of Orchy Station the line starts the long climb up onto Rannoch Moor. A few miles north of Bridge of Orchy at Achallader the railway continues to head north while the A82 road turns to the west for a different crossing of Rannoch Moor, making the area extremely remote. At Gorton there is a passing loop and signal box. The line comes to Rannoch Station before crossing Rannoch Viaduct and going through Cruach Snow Shed (the only snow shed in the UK) before continuing to the Corrour Summit over the wilderness of Rannoch Moor. Corrour is the highest railway station in the UK with an elevation of 1350 feet above sea level. From Corrour the line starts its long descent towards Fort William. 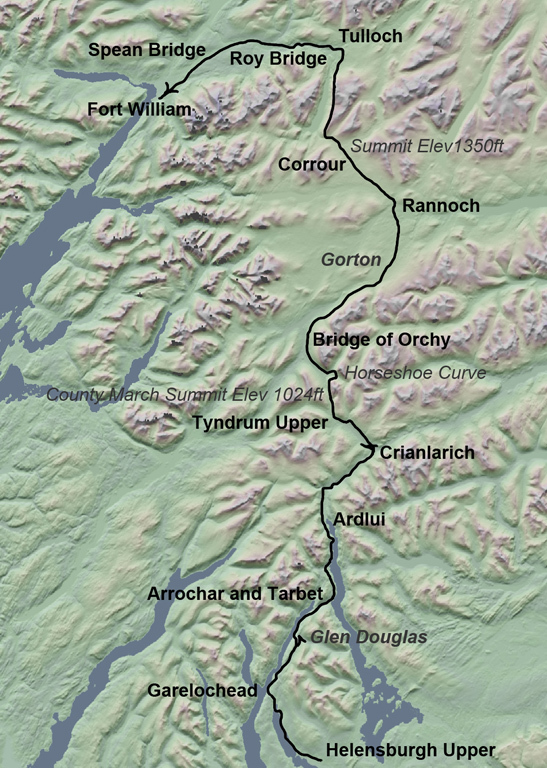 The line drops down from Rannoch Moor alongside Loch Treig which was created when the Treig Dam was built as part of the hydroelectric scheme for the aluminium smelter at Fort William, where a pipeline runs from Loch Treig. At one time a narrow gauge railway existed between Loch Treig and Fort William to service the pipeline. After passing the Treig Dam the line comes to Tulloch Station. From Tulloch, the line continues its descent along the River Spean. The line then passes through the Monessie Gorge before coming to Roy Bridge Station, the only open station, apart from Helensburgh Upper, with no passing loop. This is due to the fact the loop was removed in 1956. A few miles after Roy Bridge the line comes to Spean Bridge station. Spean Bridge was once a junction for the line to Fort Augustus at the southern end of Loch Ness. At one time the West Highland Railway planned to build through to Inverness, but this never happened and the line closed in the 1940's. The line then continues its final descent into Fort William below Ben Nevis. Arriving in Fort William the line passes the Alcan aluminium smelter which is a vital user of rail freight over the line even today. The line then passes Mallaig Junction (now Fort William Junction) where the line to Mallaig turns off to the north. At Mallaig Junction there is a yard and Fort William Depot is just beyond the yard. The mainline continues into the new Fort William station, which was relocated in the 1970's to make way for the Fort William road bypass.